The size of your pond will be determined by the space you have available, the size required to hold water long enough for the frog or salamander eggs to hatch and the tadpoles to develop into their terrestrial form, and if the amphibian species hibernate under water or not. Amphibian species can require different lengths of time to develop. For example, from 60 days for fast developing species like the common toad or up to two years for green frogs and four years for bullfrogs! The average time for most salamanders and frogs is 60 to 90 days. Local soils and temperatures also affect the water holding ability of ponds. Larger or deeper ponds may be required in well drained sandy or gravelly soils while clay soils hold water well and the pond can be smaller with less water. If the amphibians found in your area hibernate under water, then they will not survive in your pond if it completely freezes. Your pond will not completely freeze if you dig at least one section below the frost line (at least 1.52 metres deep), or you can install a pond aerator to keep the pond well aerated and to keep thick ice from forming. Amphibian species which hibernate under water include the bullfrog, pickerel frog, mink frog, green frog, northern leopard frog, mudpuppy and the red -spotted newt. Amphibians are attracted to ponds by the size of its reflective surface. If the pond surface is too small (ie smaller than 3 x 2 metres), amphibians won't even notice it! Smaller ponds suffer from temperature fluctuations and take longer to become settled and balanced. There must be enough bacteria and algae on rocks and bottom to feed tadpoles, and sufficient aquatic insect production to feed the adult frogs or toads. You will also want to have a pond big enough and deep enough to prevent predators such as crows, garter snakes and raccoons from having access to the center of the pond. Most amphibians will rest or bask along the edges of a pond but retreat to deeper water when frightened. If you are concerned about the safety of small children you may want to restrict access with a natural looking fence (cedar rail) and gate. However, large rocks can be submerged just below the waterline and these will restrict access to deeper water. 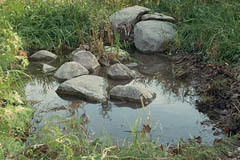 The rocks also provide a refuge for frogs and their tadpoles and may make it easier for wild life to enter and exit the pond. Rocks can be submerged below the waterline to restrict access to deeper water. Rather than limiting ponds as wild life habitat, homeowners are encouraged to use it to teach water safety. Our communities are dotted with backyard pools and water courses. Canadian children will have access to lakes, rivers, and swimming pools at some time in their life. An awareness of the potential danger and how to act responsibly around water will benefit our children and the wild life that depends upon water for survival. Our first insight that toads would breed in constructed ponds occurred when Metro Toronto Zoo received reports of toads breeding in swimming pool covers. The covers had been placed over in ground pools and these had filled with snow meltwater in the spring. Because pool covers are dark in colour they heat faster than surrounding ponds, and in this instance the toads actually appeared to call and breed two weeks before toads in natural ponds. Pool owners can help by leaving their pool covers on until the toadlets leave the water in early June. We have studied all known constructed toad breeding ponds in the Toronto area, a heavily urbanized region which surprisingly supports a large number of toad populations. One of the smallest toad ponds is concrete, perfectly round, 2.7 meters across, 0.45 m deep in the centre with gently sloping sides, and located in the center of a large expanse of lawn. Ron and Barb Mitchell of Port Credit, Ontario contacted the Zoo to report that toads had bred twice in one summer in his backyard pond. Further investigation confirmed that toads had indeed bred twice in his pond and more importantly, revealed that Mr. Martin's pond is the smallest toad breeding pond known to us- a mere one metre by 0.5 metre! The habitat of small ponds is enhanced by homeowners who plant gardens to create damp shelters for toadlets or if ponds also located near ravines or wooded areas. Of course the bigger your pond the better. The pond should be 6 meters long and 4 meters wide. Ponds of this size may be intimidating. However, once set in the ground and planted around the edges to create terrestrial habitat, your pond will not appear to be quite so large. Amphibian ponds should be no smaller than 4 metres long and 2 metres wide and at least 0.5 metres deep. Many suppliers sell small pool liners indicating that they are suitable for frogs. Although a frog could live in these ponds over the summer, there is no possibility that the frog could overwinter or breed in these small ponds. Many of the so-called "frog ponds" sold by nurseries in pre-packaged boxes are solid fibreglass. These are deep, with very steep sides and are death traps to amphibians that may fall in and cannot climb out of the water. Let your nursery know that these ponds are either too small or steep sided to support a breeding amphibian population. If you are building an irrigation pond please remember that extreme water level fluctuations reduce the ability of native plants and animals to establish themselves. Increasing the size of the pond will reduce the fluctuations in water level.